PMB faculty member Vincent Hilser leads a team of scientists that “cracked a key part of the mystery surrounding a distinct type of protein” that could lead to treatments for diseases from cancer to neurological disorders. Science! Dr. Rachel Green was one of seven Hopkins faculty members newly elected to the National Academy of Medicine (NAM), considered one of the highest honors in the fields of health and medicine. Members of NAM are recognized for having made major contributions to the advancement of the medical sciences, health care, and public health. The incoming PMB class for 2017 has arrived and already attended their first IBR Retreat. We are so excited to have them here to do science with us! Jeff Gray, Bertrand Garcia-Moreno, James Berger, Jie Xiao, Taekjip Ha, Sua Myong and Marc Greenberg were all part of various interdisciplinary research teams who received support this year from JHU’s Discovery Awards program. 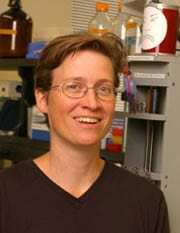 Prof. Karen Fleming honored with Diversity Recognition Award! The March for Science is an international movement that was organized due to the realization by people across the world who value science in their lives that staying silent is no longer an option. Marches are being planned across the United States and internationally. PMB graduate student Sarah Kim is winner of the annual Biophysical Society’s Student Research Achievement Award for her poster in the category Permeation & Transport. The Women of Hopkins exhibit grew from a grassroots effort at Johns Hopkins called Achieving Gender Equity in Sciences, a reading and discussion series exploring biases women face in the STEM fields. As part of the effort, PMB Professor Karen Fleming participated in the Diversity Innovation Grant competition aiming to increase the awareness of female heroes from Hopkins and was awarded funding for the Women of Hopkins Art Exhibition.